As we've reported, Belize is currently holding the pro-tem presidency of SICA, the Central American Integration System. So far that has meant high level meetings of the Ministers of Forestry and Fisheries, Energy and Science, Agriculture, and now, today in San Pedro, the Council of Foreign Ministers met. 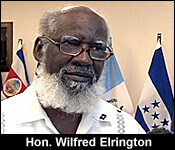 This meeting, like two of the others was held in San Pedro Town, and Foreign Minister Wilfred Elrington told us what's on the agenda:..
"The important areas which we are going to continue to emphasize are the 5 pillars identified and prioritize by the heads of government. In our last meeting at Punta Cana in Dominican Republic and these are areas including climate change, disastrous management, democratic security, economic integration, social inclusion, poverty alleviation and institutional strengthening. They are all excited by the prospect of working more closely with Caricom in matter of climate change with which Caricom has some expertise with the area of energy. We are working together dealing with security and crime and we are also very much concern with the economic development of the region. Perhaps one of the most exciting things is that it has been agreed that we are going to host the very first meeting of government officials in Belize in October regional government officials to look at the trade situation in Belize - Obstacles to trade and what needs to be done to facilitate the removal of those obstacles." The meeting was a one-day event and it was held at the Grand Caribe resort. 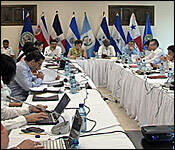 Today the council on Social Integration in Central America held its 62nd ordinary meeting in San Pedro. The focus of SICA's meeting is on the development and cooperation among the region's Human resource. 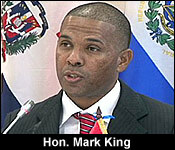 Belize was represented by Area Representative for Lake Independence, Hon. Mark King. He explained the importance of focusing on the development of people. "The emphasis is usually on the movement and exchange of goods and services, the removal of tariff barriers and such considerations which are all very important but sometimes the human beings gets lost. The beauty of social integration is that it places emphasis directly on the human being, the citizens and his/her concerns and welfare comes into sharp focus. It has incredibly played an important role in ensuring the development in our sub-region is people centered." There were 7 member states represented at the meeting including Belize.